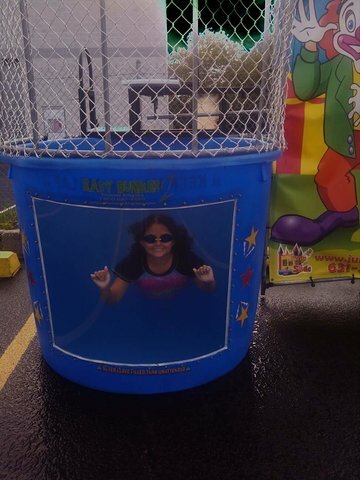 Our ‘Easy Dunker’ Dunk Tank has been delighting crowds for years. The concept of dunking the boss at the company picnic, or dunking a local ‘celebrity’ at fund raising events has become an American pastime. The ‘Easy Dunker’ has always been a favorite at fairs, carnivals, and block parties. REQUIRES A 6FT. GATE OPENING.We cannot lift up stairs or over any gates Dunk tank CAN BE USED ON PAVEMENT. We deliver to all of Nassau and Suffolk County for party and inflatable rentals. We also deliver to ALL the Hamptons for all your inflatable and party needs!